dating back to 1690, the building was originally a vicarage. over the years it became a private house, then the heversham hotel. later it was renamed ‘the blue bell’, after the bell in the bar which came from heversham railway station. finally, after this latest restoration programme it was reinstated as the heversham hotel in 2016.
the hotel is owned by samuel smith’s, a brewery with a real passion for the conservation of historic buildings. Lyons was chosen by the brewery’s architect to carry out the masonry works on this major project which ran from Summer 2015 until September 2016. The project grew in scale significantly, thanks to the many additional issues discovered during the progress of the works. Initially, the incongruous 1960s additions to the building were removed, so that Lyons could set about the structural repairs. A meticulous and lengthy schedule of stonework replacement and restoration followed. 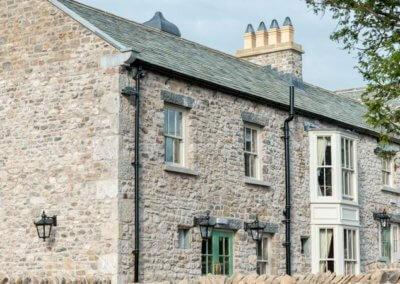 New stone was locally sourced and masoned to match the existing features on the building. Each was then skilfully installed, using traditional lime mortars.